The ubiquitous Swatch watch is manufactured by the Swatch Group, a Swiss conglomerate whose name is derived from a combination of the words “second” and “watch,” meaning not one's primary timepiece. 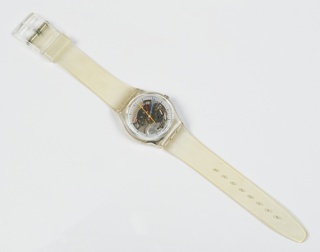 The company introduced its first watches in 1983, at a time when digital timepieces were enjoying wide popularity. Intending to re-popularize the analog watch (which first appeared in the 17th century), Swatch developed a range of low-cost, high-tech, artistic and fun quartz-powered wristwatches in bold designs made of bright synthetic materials. Technical innovations included an innovative ultra-sonic welding process, automated assembly, simplified gearing, and a reduced number of components; Swatch was... more. We have 2 objects that Swatch has been involved with.